It is said about Nepal that every other structure is a holy shrine and every day a festival. Well, if the number of annual festivals, both religious and national, is any indication, the saying couldn’t be truer. Festivals are an essential part of Nepalese life that garners tremendous local participation. Festivals also offer visitors a valuable opportunity not only for having fun but gaining insight into various aspects of Nepalese culture. The religious festivals have fixed dates. Wherever or whenever you arrive in Nepal. You can be pretty sure of being at the right time for one or more special events. Some of the major and interesting festivals are presented below. The Nepalese New year’s day usually falls in the second week of April. i.e The first Day of Baisakh. The day is observed as a national holiday. The people celebrate it with a great pomp and show. On this occasion, Besket Jatra is held in the city of Bhktapur. As Nepal is the birthplace of Lord Buddha, the light of Asia, the triple anniversary of the Buddha’s Birth, enlightenment and death is observe with many colorful ceremonies on this day. People celebrate the occasion with great veneration paying homage to Buddha at places like Swayambhunath, Boudhanath and Lumbini. This festival is the biggest socio – cultural event of Patan. The wheeled chariot of deity known as Bungdyo or Red Machhhendrant is made at pulchowk and dragged through the city of patan is several stages till in reaches the appointed destination. The grand finale of the festival is called the Bhoto Dekhanune or the showing of a vest” A similar kind of chariot festival to Machchendranatha is also held in Kathmandu city in the month of March April. In this festival teen-aged boys dressed up as cows, parade the streets of the town. This costume springs from the belief that cows help the members of the family who died within that year to travel to heaven smoothly. Some are also dressed up as an ascetic or a fool for achieving the same objective for their dead family members. Groups of mimics improvise short satirical enactment on the current social scenes of the town for the entertainment of the public. The week beginning from Janai Purnima actually unfolds a season of many good religious and cultural activities. All the Buddhist monasteries open their gates to the visitors to view their bronze sculptures and collection of painting for a week. At Patan, one observes the festival of Mataya at this time. The festivity of Gai Jatra itself lasts for a week enlivened by the performance of dance and drama in the different localities of the town. The spirit of the old festival is being increasingly adapted by cultural centers, newspaper and magazines to fling humor and satire on the Nepalese Social and Political life. Like Gai Jatra, this also heralds a week of religious and cultural festivity in Kathmandu. There are several face of this festival. On the nights when this festival begins members of the family in which death has taken place within one year, go around the town limits of Kathmandu burning incense and putting lamps along the route. The same morning a tall wooden pole representing the statue of Indra and large wooden masks of Bhairab are put on display in the bazaar. Several groups of religious dance like the Devinach, Bhairava and Bhakku as well as Mahankalinach come into life during this week. The week also commences with pulling of chariot of Ganesh, Bhairava and Kumari in Kathmandu. On this historical day, King Prithvi Narayan Shah made a victorious march with his troops into the town and ascended the throne of Kantipur the old name of Kathmandu displacing the Malla King Jaya Prakash Malla. It is truly the national festival of Nepal. Every Nepali is stirred by the prospects of joy that this festival is supposed to bring with it. The change of mood is also induced psychologically by the turn of autumn season after a long spell of monsoon, introducing clear and brilliant days, an azure blue sky and a green carpet of fields, the climate is also just ideal at this time, it is neither too cold nor too warm. The Nepalese cherish their Dashain as time for eating well and dressing well. Each house sets up shrine to worship the Goddess at this time. Barley seeds are planted on the first day in every household and nurtured for nine days. During this period Goddess Durga Bhawani is worshipped and offered a lot of blood sacrifices. Buffaloes, goats, chickens and ducks are killed by the thousands at the temples at military posts and in every household. One of the main center that witnesses the animal sacrifice in a Large scale at this time is the Hanuman Dhoka palace on the ninth. On the concluding day of the festival called the Tika, the elders of the family give Tika to their junior members and to other relatives who may also come to seek their blessings. The fresh shoots of the barley's are also given. Family feasting and feeding of guests is a common practice at this time. It lasts for five days and is marked by worship to different animals such as crow, the dog and the cow, five various days. The most important day is Laxmi puja. The most endearing sight of this festival is presented by the illumination of the entire town with rows of tiny flickering lamps on Laxmi puja. In the evening of this day, the Goddess of Wealth, Laxmi is worshipped at every household and it is on her welcome that myriad of lamps are burnt. On the fifth day sister show their affection towards their brothers with puja and feed them with delectable food. They pray for their brother's long life to Yama, the Hindu God of death. 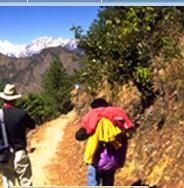 This festival is most impressively observed in the month of January, February by the Sherpas. They organize folk songs and dances on this occasion. These dances can be seen in Khumbu, Helambhu and other northern regions on Nepal and also at Baudhanath in Kathmanduu. This is the most famous and celebrated festival of Nepal which attracts large crowds from far flung places both in India & Nepal. The festival is consecrated in honor of Shiva. It is observed by bathing and holding of a religious fast. All Shiva shrines become the places of visit for “Darshan”, but the greatest attraction of all is held by the temple of Pashupatinath in Kathmandu. One gets to see thousands of Hindus devotees coming to visit the temple of Pashupati. Among them are a large number of Sadhus and Naked ascetics. Many people like to keep awake for the whole nights keeping vigilance over an oil lamp burnt to please Shiva. Children are seen keeping awake similarly over a bonfire in many localities. In the afternoon an official function is held to celebrate this festival at Tundikhel. The Royal Nepal Army organizes a show in which series of gun fire are sounded. The ceremony is witnesses by His Majesty the King. Teej is a festival of womanhood. This is a special festival for married women who are supposed to fast all day and bathe in the holy waters of the rivers. Dancing, folk songs and the red color sari that are worn by them on there wedding day dominate the day of Teej. Red is a symbol of joy and happiness in Nepal and the color used for marriage ceremonies. Married women are supposed to wear a lot of red. The days recall the heavenly occasion when Parvati, daughter of the Himalaya, won the hand of Lord Shiva after severe meditation and fasting. On the fist day of this festival mothers send sweet, meat, saris to their daughters' houses. On this day group of women gather together to feast. At midnights, the women begin a fast in emulation of Parvati. The second day is for worship. The married ones ask for happy and productive marriage and a long life for their husband. Those yet to tie nuptial knots ask for a good husband. It is believed that their married life will be long and happy and they will not lose their husbands if they celebrate this festival. The entrance to Pashupatinath Temple is a good place to watch as crowds of women come down to the river, dressed in brightly colored saris with red marks on their foreheads. Rishi Panchami falls on the third day of Teej. On this day, the seven rishis, or sages, of the Hindu pantheon are worshipped by women to cleanse all sins of the previous year. Sages are the symbol of the purity of religion and holy practices in this earth. On this day women clad in red dress descend to the holy Temple of Lord Pashupatinath to pray to Lord Shiva. Women clean their teeth and bathe at the holy rivers especially at the Bagmati River near the Temple of Pashupatinath.